Organizations are continually rethinking how to best leverage space and technology to enable their workforce to collaborate. Today’s knowledge workers and students expect to be able to work together in small groups, participate in conference calls, connect via video chat, and share content from their laptop, tablet, or phone. These modern workforce expectations remain the same for both local and offsite employees. Along with the rising demand for collaboration comes the need for properly-designed and equipped meeting spaces. Businesses seek technology solutions to help them meet the demand while also making efficient use of their available floorspace. 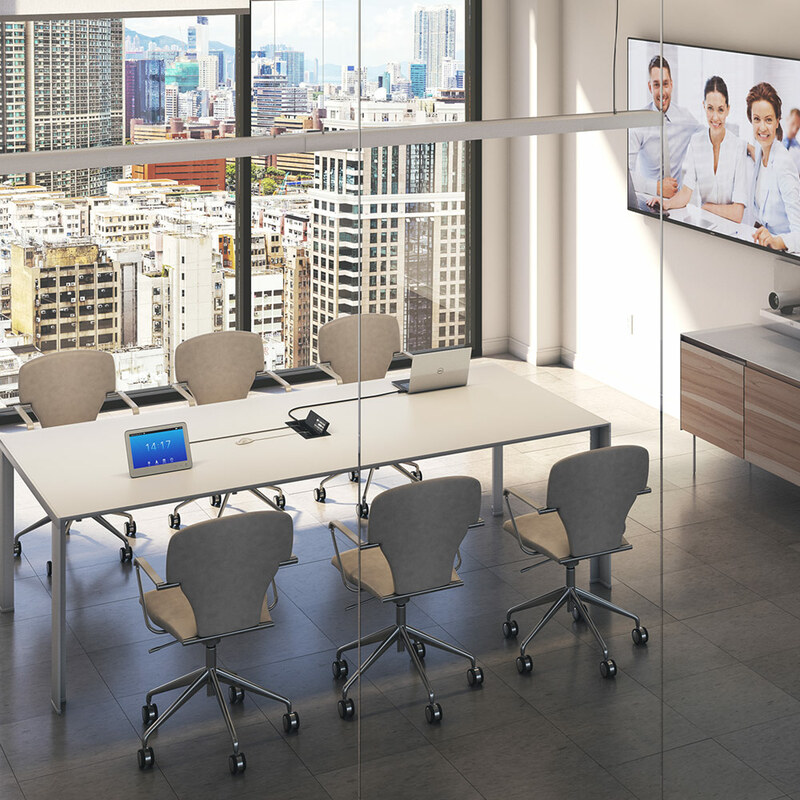 In addition to updating existing conference rooms and boardrooms, technology can be used to transform unused office areas into open meeting spaces and huddle rooms. Options like these enable more productive meetings and provide areas that are frequently used by groups for quick meetings and project collaboration. 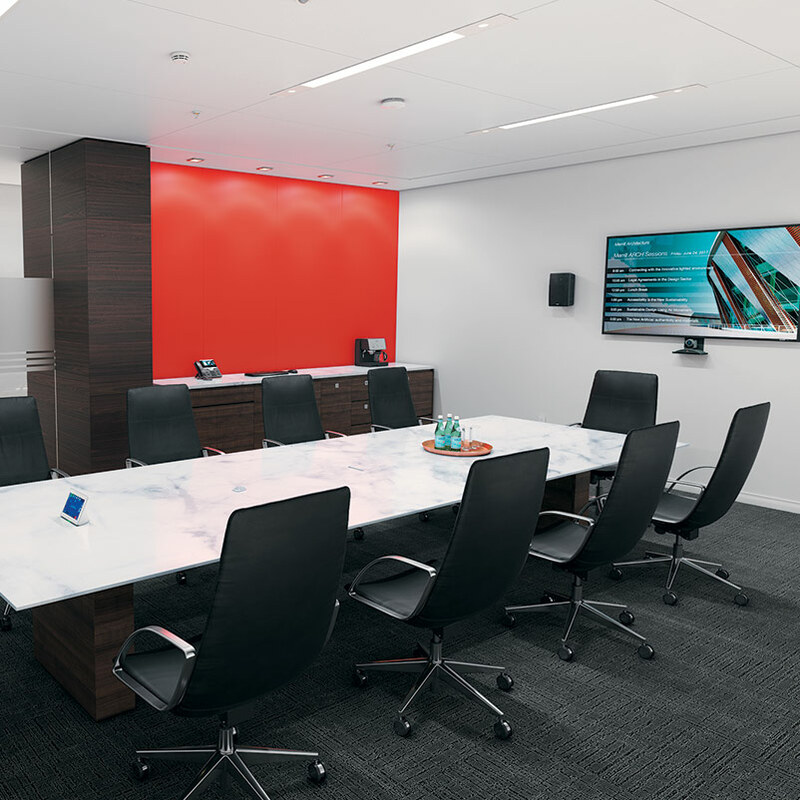 Extron collaboration technology supports the modern workspace by creating meeting rooms that are easy to use, schedule, and manage remotely. In addition, we have the system design experience, customer support, and enterprise software solutions to help ensure your success. 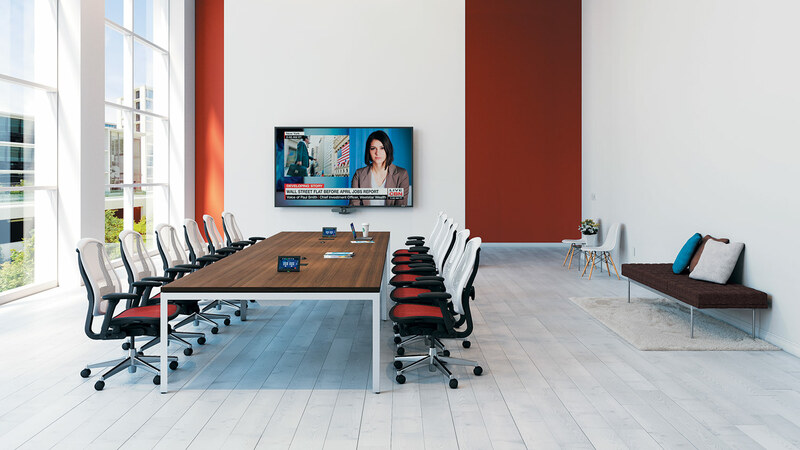 Whether designing a large conference room, a training room, or smaller huddle spaces, it’s critical to provide the right communication and collaboration technology to simplify and enhance meetings. 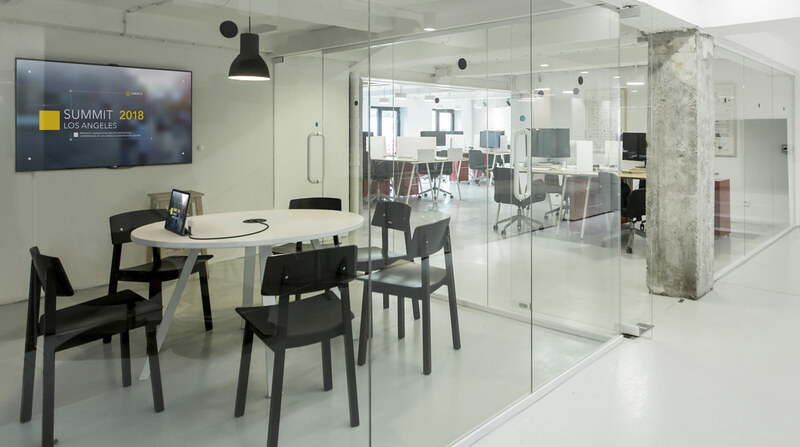 Scalable Solutions – The technology solution must be customizable to meet the needs of various collaboration spaces from the smallest and simplest to larger and more complex. Intuitive Operation – Users must be able to enter the space and get going immediately without any training on the system. 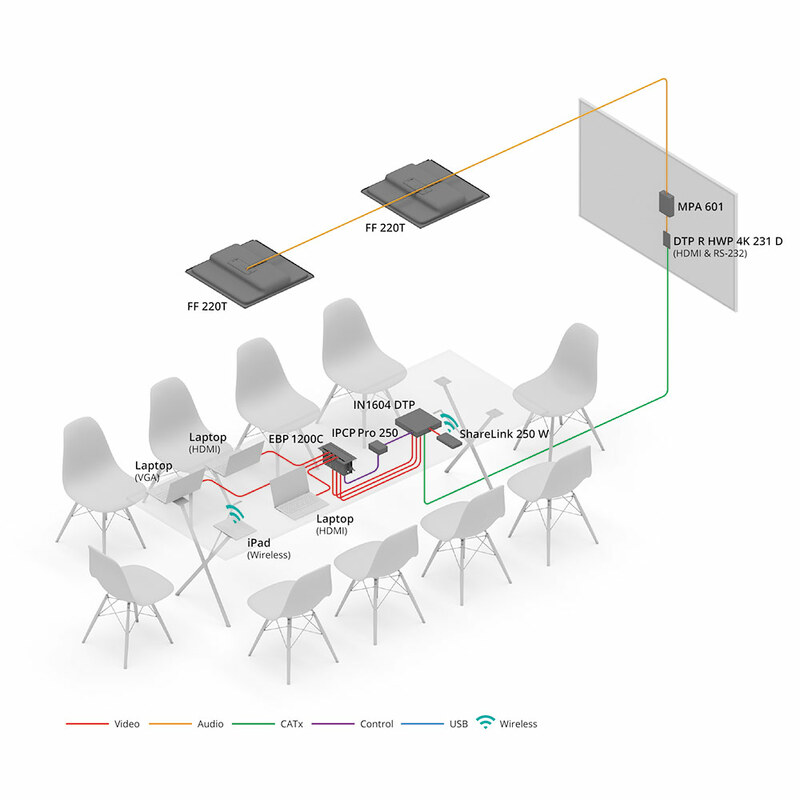 Flexible Capabilities – Users should be able to easily share the content from their laptops, tablets or phones with a wired or wireless connection. Secure Network Connectivity – To support scalability to dozens or hundreds of rooms in the enterprise, systems must be network connected to provide remote support, monitoring and firmware updates. Integrated meeting solutions from Extron combine application-specific hardware along with powerful AV resource management tools. We offer a complete AV technology platform that makes meetings more productive and optimize use of available resources. 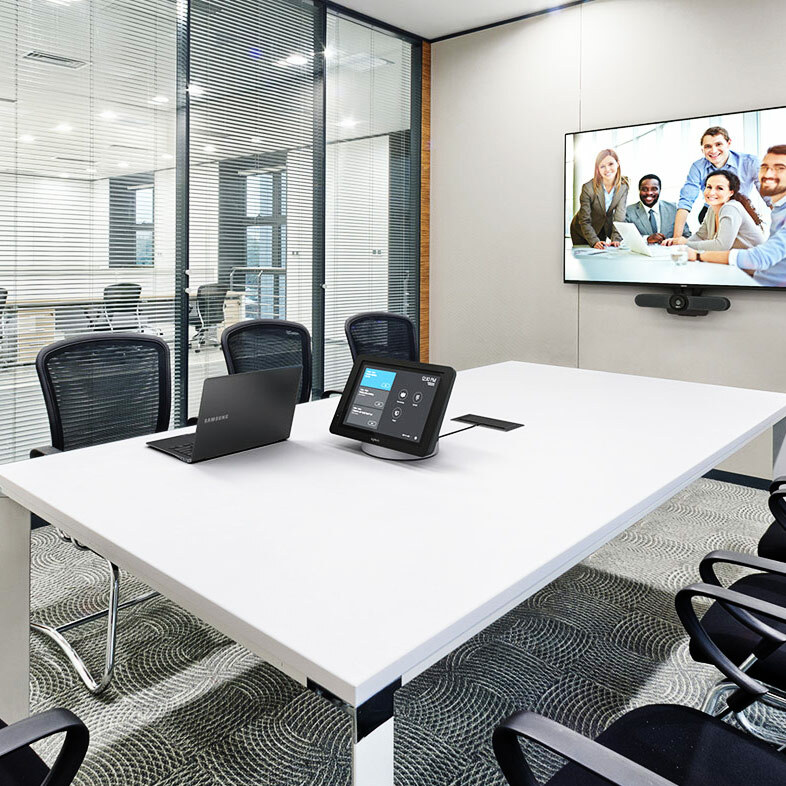 This combination further enhances collaboration by delivering connected meeting spaces with automated functionality, consistent user experiences, and convenient room scheduling. 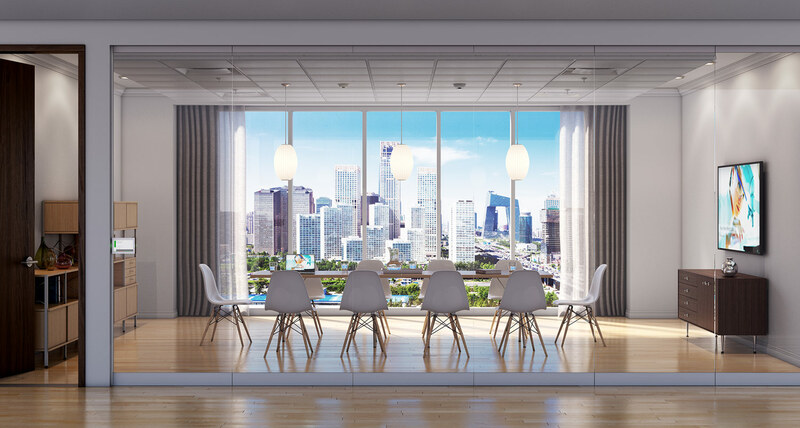 In today’s business environment, meeting rooms are in high demand, and finding an available space can be a time-consuming experience. We have simplified the room booking experience with Extron Room Scheduling. 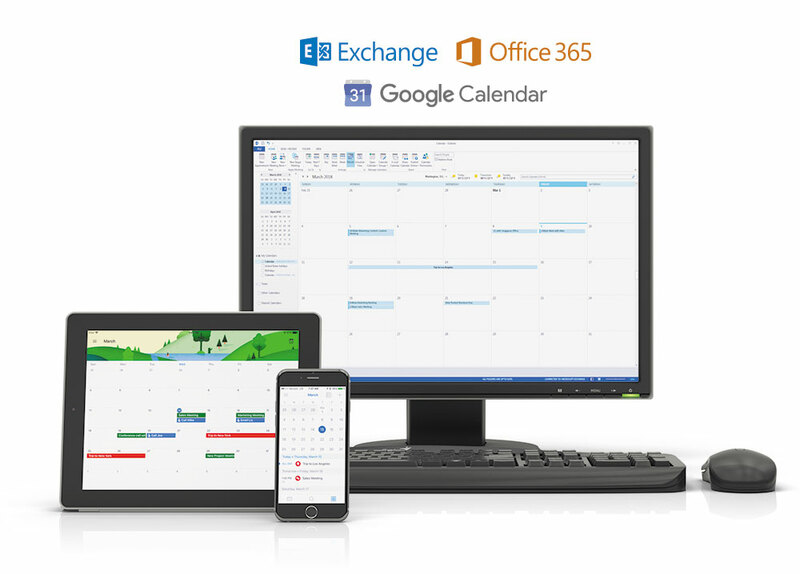 This stand-alone system consists of elegantly-designed TouchLink Scheduling panels that connect directly to Microsoft Exchange, Office 365, or Google Calendar. Users can make reservations directly from these panels, a computer, or any smartphone or tablet that connects to any one of the supported mail servers. GlobalViewer Enterprise software simplifies AV system resource management with intuitive control for hundreds of common AV tasks. Whether you’re working with 5 or 5000 rooms, GVE provides a powerful, flexible way to manage, monitor, and control nearly any device over a standard network. It’s quite common for corporations, universities, and government agencies to have hundreds of collaboration spaces spread over broad areas. GVE allows you to manage this ever-increasing AV technology while effectively leveraging valuable help desk resources. The Help Desk view in GVE provides all the information you need from the entire enterprise or campus, all in one, easy-to-navigate interface. The Help Desk view provides a balance between power and usability. 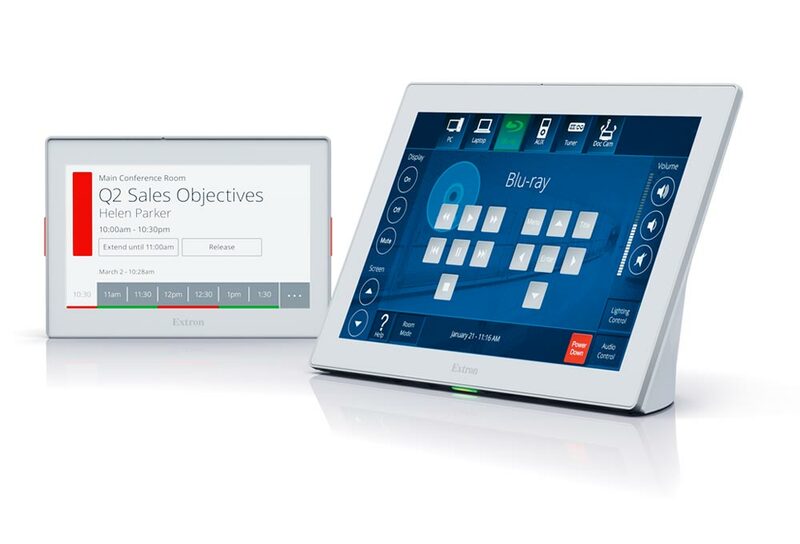 Easily navigate between rooms, manage each system with multiple tools, remotely interact with the Extron control products using visual representations, and see system notifications all within one view. Reporting tools help you make informed decisions about inventory and maintenance plans. View device and room usage trends to help improve equipment standardization across rooms, identify energy usage forecasts, and maintain inventory lists. It’s easy to create schedules based on location or device type. Set a global schedule to turn off all displays in an entire building at the end of the day, schedule multiple actions to lock the front panel of multiple controllers, or schedule reminders for maintenance and support tasks. GlobalViewer Enterprise minimizes the burdens of user administration. By simplifying access control for team members and creating custom user roles, administrators can easily govern security policies while still allowing users or user groups access to the specific features they need. 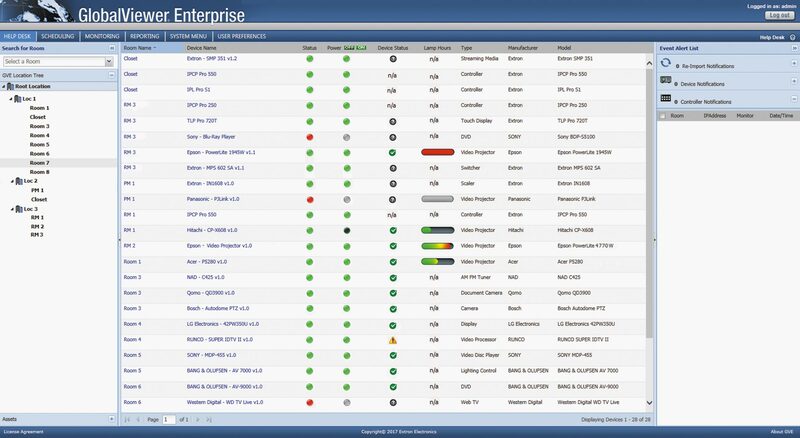 Proactively monitor the status of AV equipment based on locations or device types throughout the enterprise. Get detailed email or text alerts on projector lamp life or if a device unexpectedly goes offline. Enhanced monitoring and scheduling tools provide significant time and cost savings. Instantly access room scheduling and availability for popular facility scheduling applications including Microsoft Exchange, Office 365, iCalendar, Google Calendar, CollegeNET R25, and 25Live. Simplify operations with notifications that appear in the Help Desk view. Get status notification of your system configuration import or re-import, devices, controllers, and additional system events. These notifications and event logs add insight into system monitoring and help maximize efficiency. Use the iGVE App to effectively manage and control AV installations on-the-go from Apple iPad, iPhone, and iPod touch devices. Extron RoomAware Workspace Automation is a suite of time-saving features that anticipate user needs and intelligently deliver room automation and control across the enterprise. 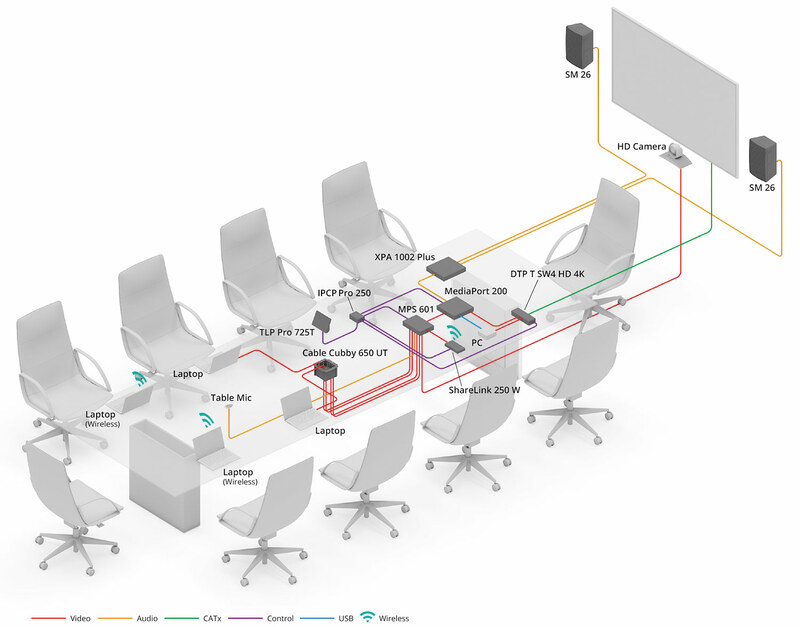 RoomAware enables smart connections between Extron devices and services to save valuable time by preparing the room for the participant prior to their arrival. Extron has developed the technology to integrate with the leading UC solution providers, providing a one-touch user experience for conferencing, collaboration, and control. Through our partnerships, we can extend Extron control capabilities to spaces that use Zoom, Cisco, Logitech, and many other popular providers. 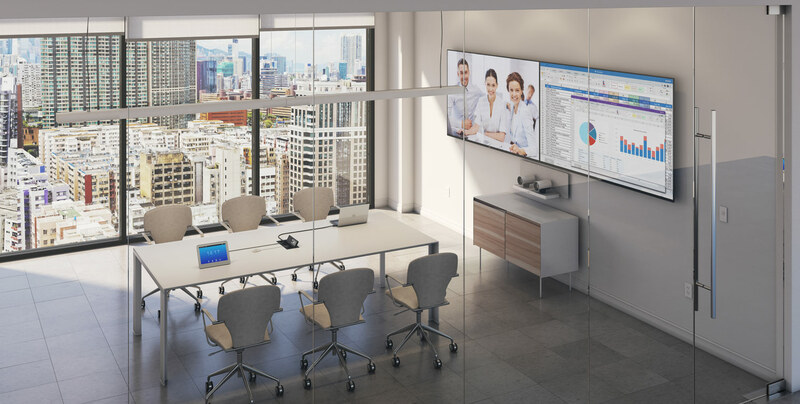 We offer complete system integration for convenient, centralized control of conferencing systems, audio, video, lighting, window shades, and much more. 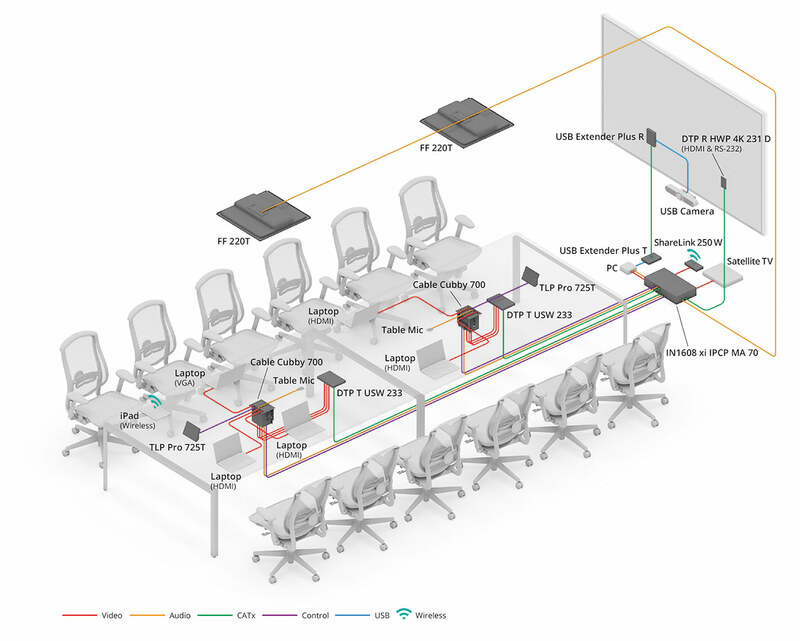 AV system designs run the gamut from small collaboration spaces and conference room systems, to large-scale AV distribution systems. Rarely, if ever, is a presentation system limited to a single source and a single display, connected with one HDMI cable. 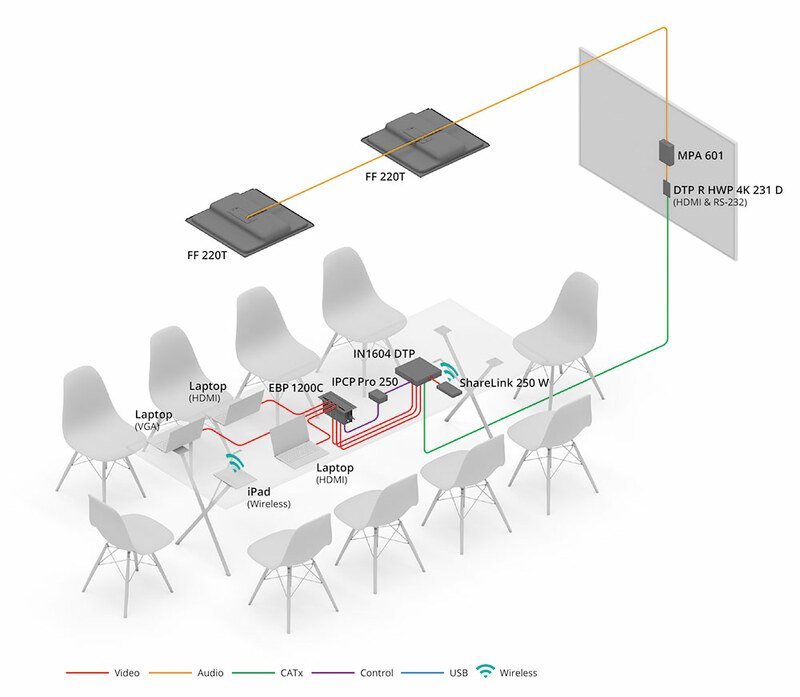 Even the smallest AV system design generally includes a variety of signal types and resolutions. The following designs represent a cross-section of typical AV environments and applications. System drawings depict the sources and displays, signal flows between them, and a recommended approach for an effective system design. Open meeting spaces are a mainstay of the open office concept. They are used for informal meetings, discussions, and collaboration. In traditional office settings, open areas such as lobbies and other informal sitting areas are often used for impromptu meetings. 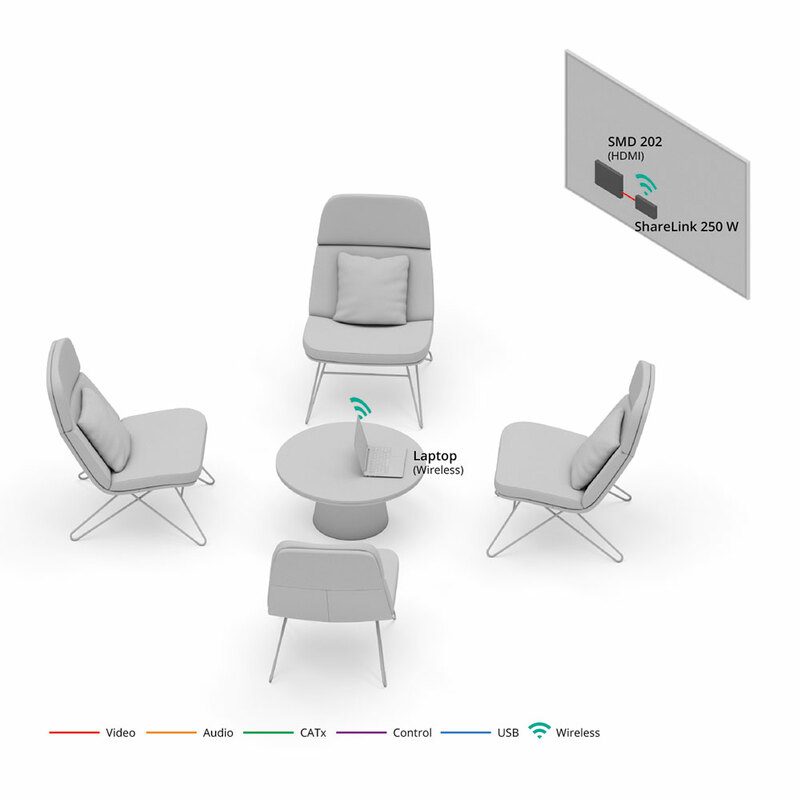 These spaces typically include a display for content sharing and a wireless collaboration gateway for connecting personal devices. This system is managed over the network and supports a wide variety of smartphones, tablets, and laptops. An Extron ShareLink wireless collaboration gateway enables secure connection to the display and prevents unauthorized access to the corporate network. When the meeting space is not in use, the display provides digital signage content. The huddle room is designed for a small group of team members to concentrate on the specific details of a project without the distractions that often occur in an open office. The space is smaller than a typical meeting room, accommodating just a few people. A minimalistic technology approach is taken within these rooms. 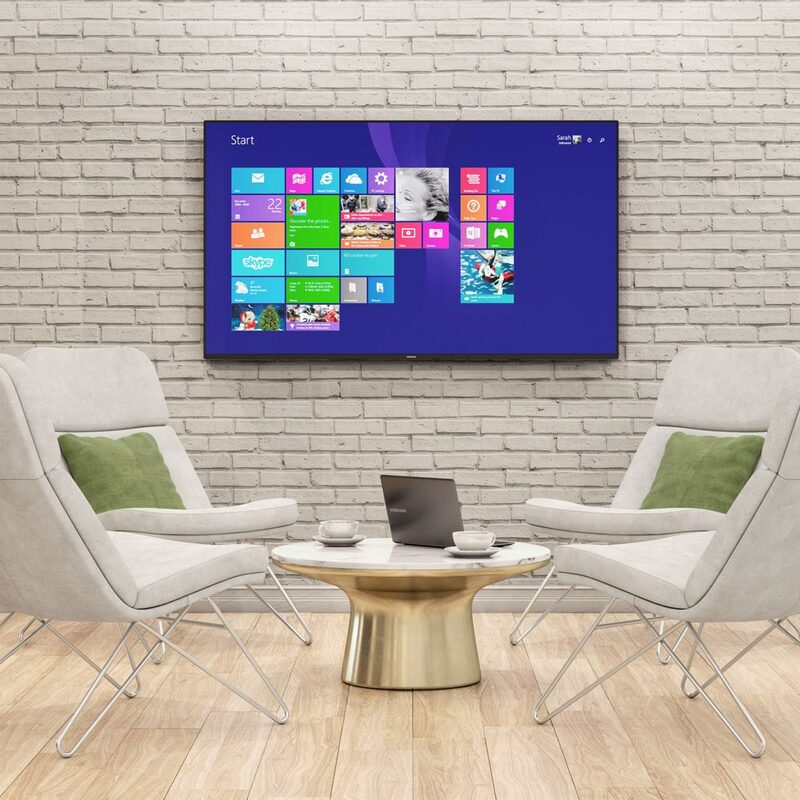 This system supports two HDMI source connections at the table with quick and easy input selection. Cable management and AC power along with simple push-button display power control are provided for intuitive operation. AV signals are switched to a single flat panel display with an HDMI input. 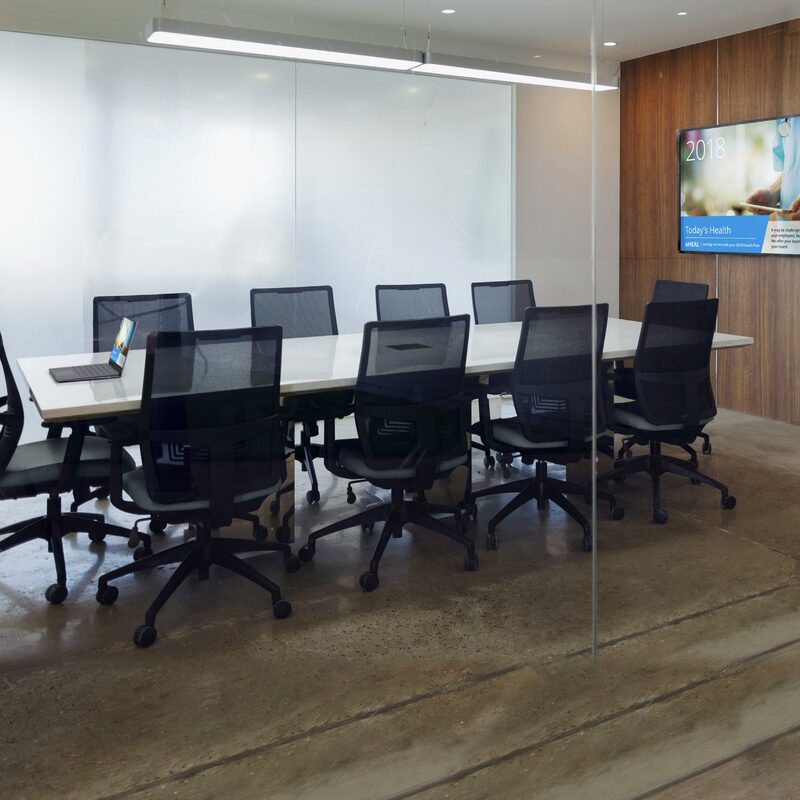 Huddle rooms with video conferencing capability enable internal collaboration with remote team members at different geographical locations. This system utilizes the Logitech® SmartDock System, enabling meeting attendees to use the full range of Microsoft® Skype for Business conferencing features while having access to AV control from the same interface. 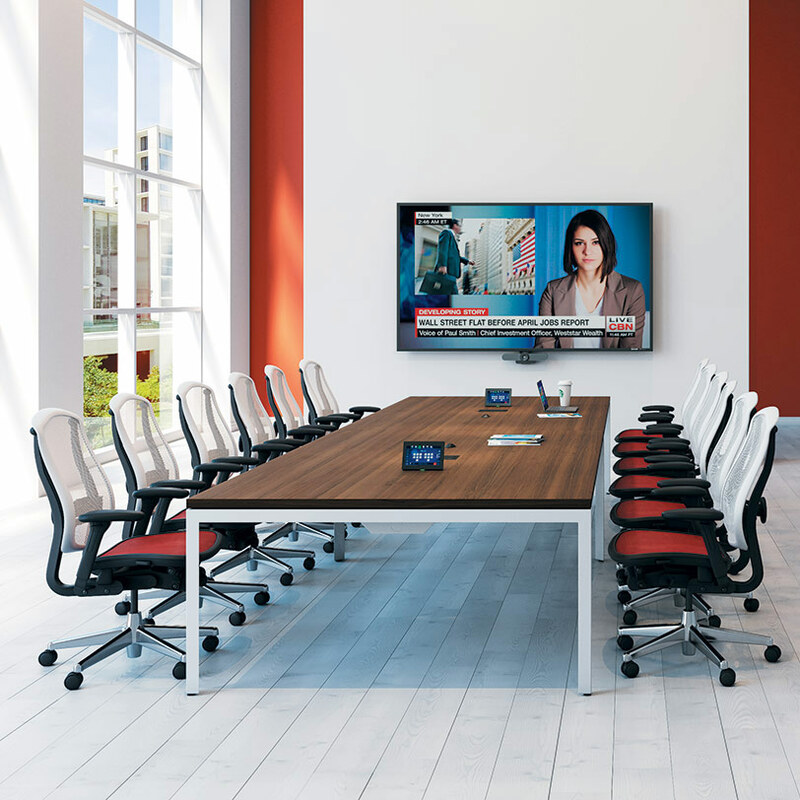 This system provides convenient HDMI connectivity at the table and supports wireless presentation via the corporate network. Cable management and AC power provides easy accessibility. A Logitech ConferenceCam MeetUp Camera is mounted below the display. AV signals are sent from the SmartDock through an Extron HD CTL 100 Workspace Controller to the display, enabling automatic display control. Meeting rooms accommodate more attendees than huddle rooms. 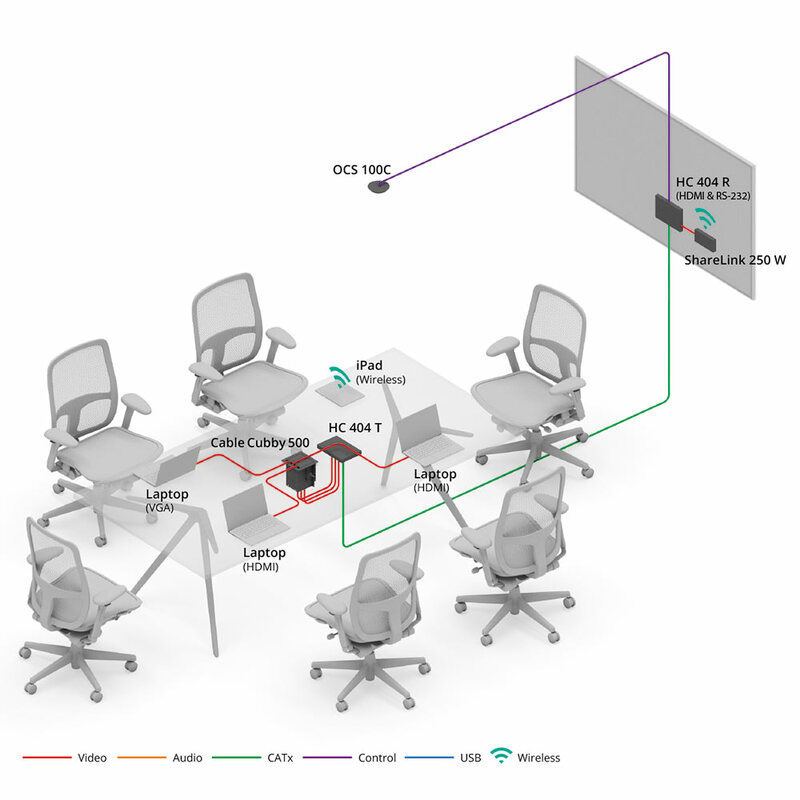 They are designed for content sharing and collaboration with minimal setup and configuration. This system supports two HDMI and one VGA source connection, as well as BYOD wireless connections. The display automatically powers up when the room is occupied. Each source can be easily selected and minimal user interaction is required to operate the system. Cable management, AC power and push button source selection and an occupancy sensor for display power control is provided. AV signals are switched to a single flat panel display. 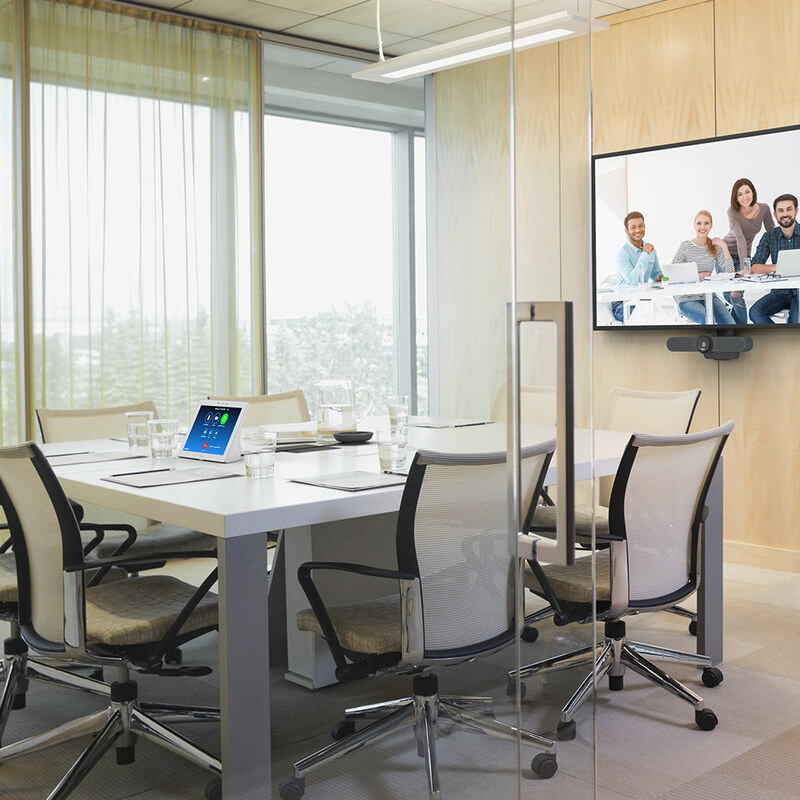 A meeting room with video conferencing offers more functionality and space than typical huddle rooms and enables presenters to share content with remote team members. 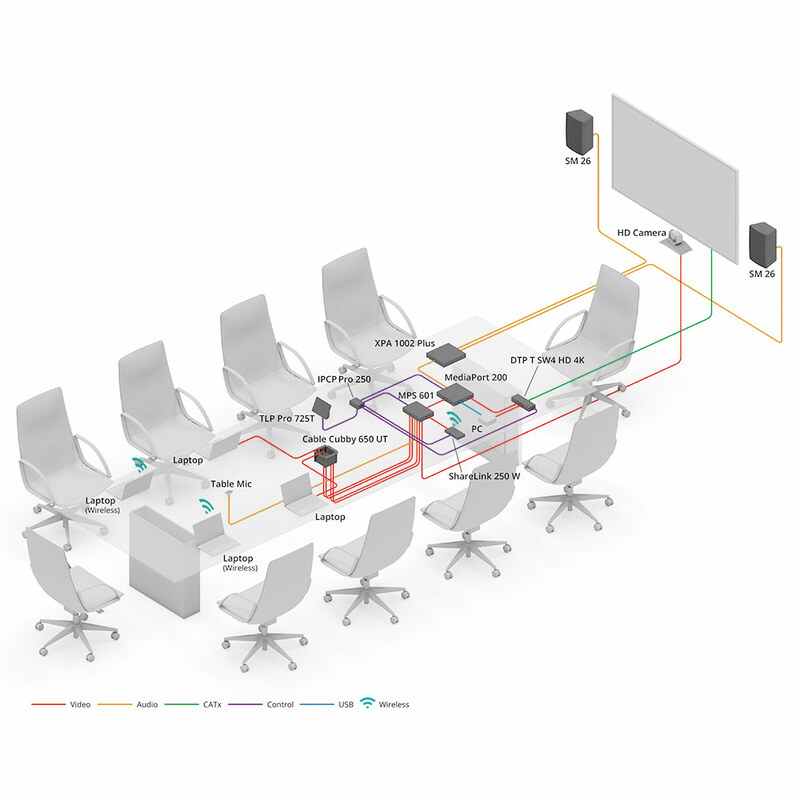 This system combines Zoom Room System conferencing with intuitive AV system control. The switching system supports HDMI and VGA at the table plus control of the display. A USB speakerphone manages room audio and a USB camera is mounted below the display. The speakerphone, camera, and display are connected to the resident PC running the Zoom Conferencing application. The room also features cable management and AC power connectivity at the table, and USB extension for the speakerphone. 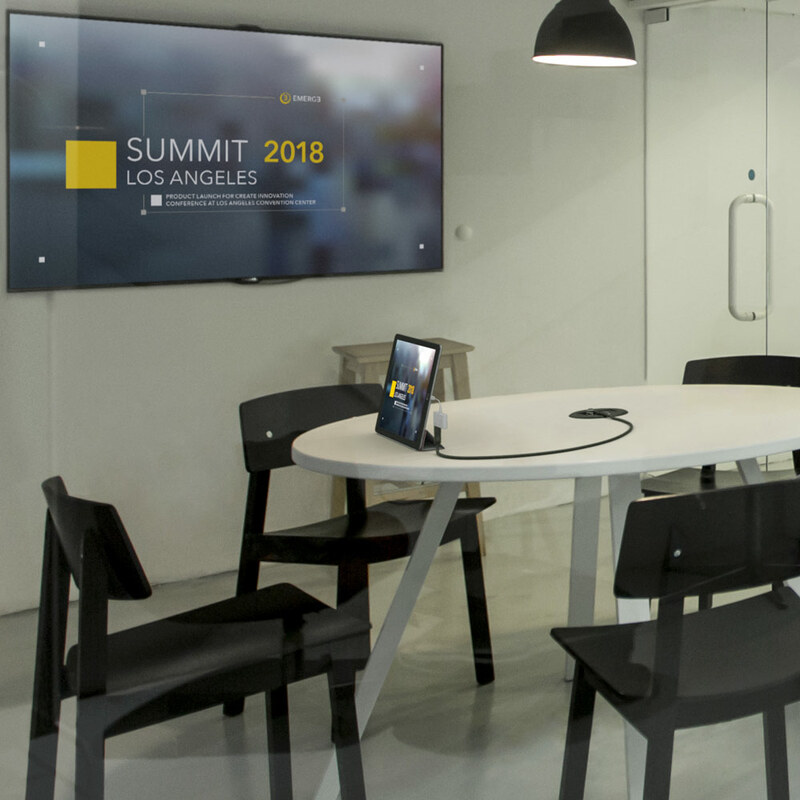 A meeting room with video conferencing accommodates more attendees than huddle rooms and enables presenters to share content with remote team members. This system supports HDMI, DisplayPort, and VGA sources at the table. 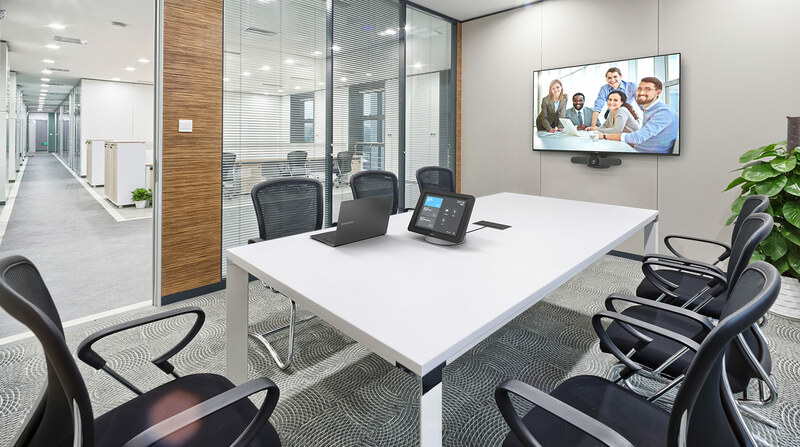 The video conferencing system utilizes a dual-camera setup and the Cisco Telepresence Touch 10 for controlling conference functions while providing an interface for adjusting environmental settings. The cable management system also provides AC power and includes a button panel for AV device control. Twisted pair extension is used for signal transmission within the room. The room size requires an audio system for sound reinforcement with ceiling tile speakers delivering consistent sound levels across the listening area. 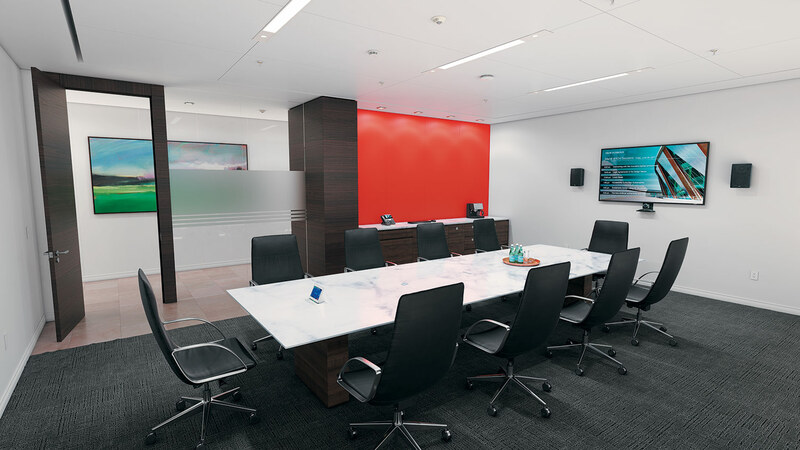 Conference rooms provide a more formal setting for meetings and collaboration. Accommodating up to 12 people, they are larger than typical meeting rooms and are generally equipped for multi-purpose gatherings. 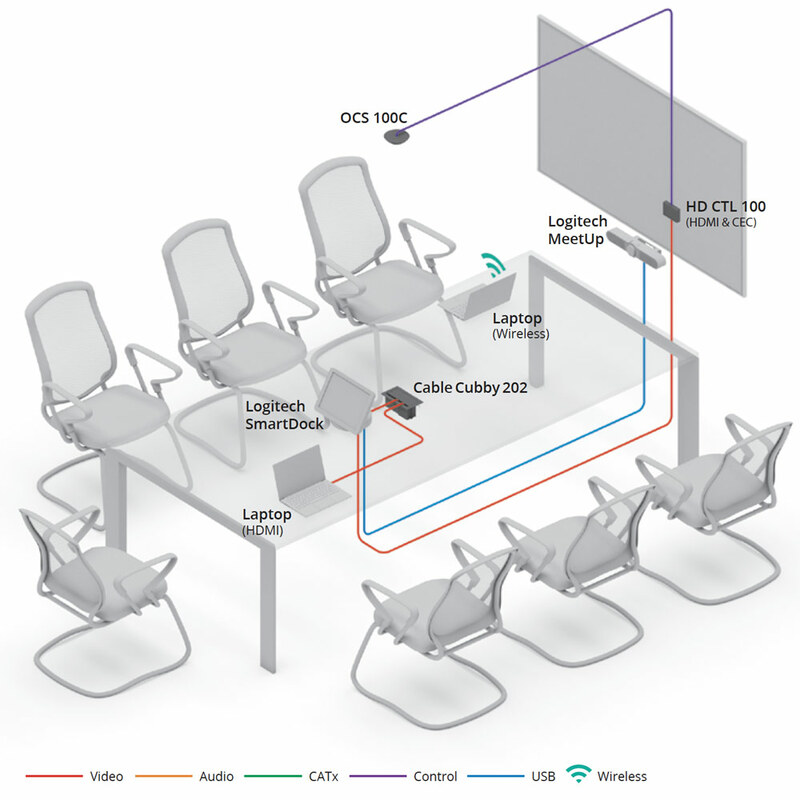 This system supports two HDMI and one VGA source connection at the table along with BYOD wireless connections. It includes a button control panel for AV device control as well as cable and AC power management. An Extron TouchLink Scheduling Panel supports convenient booking of the room. Twisted pair extension is used for signal transmission within the room. The room size requires an audio system for sound reinforcement with ceiling tile speakers delivering consistent sound levels across the listening area. The enhanced conference room accommodates up to 12 people and includes video conferencing capabilities, enabling team members in remote locations to participate in meetings. The room includes advanced control capabilities and can be used for collaboration, presentations, and video conference calls. 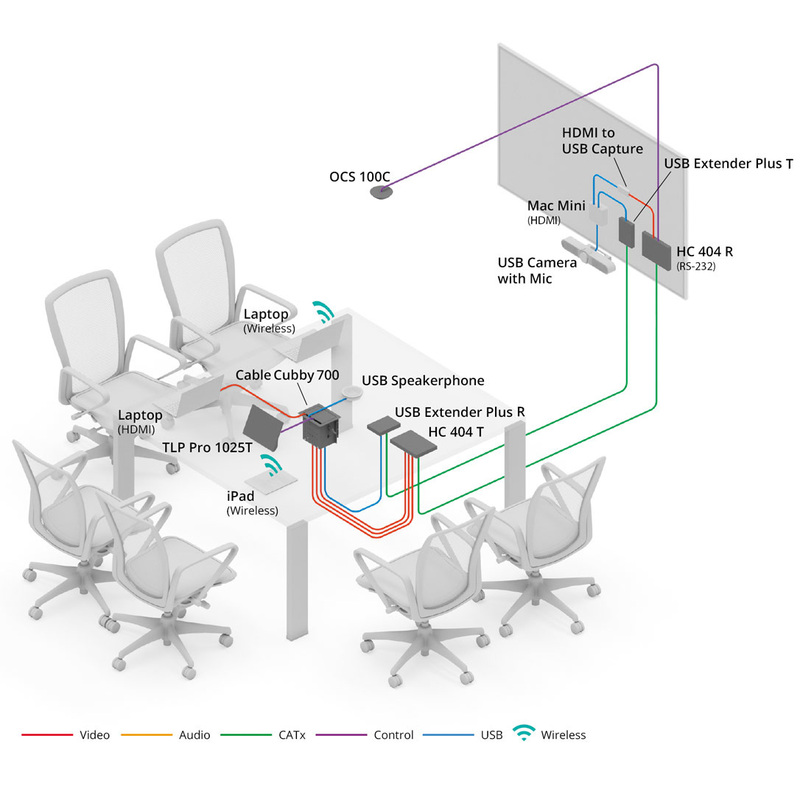 This system supports two HDMI and two VGA source connections at the table along with BYOD wireless connections. 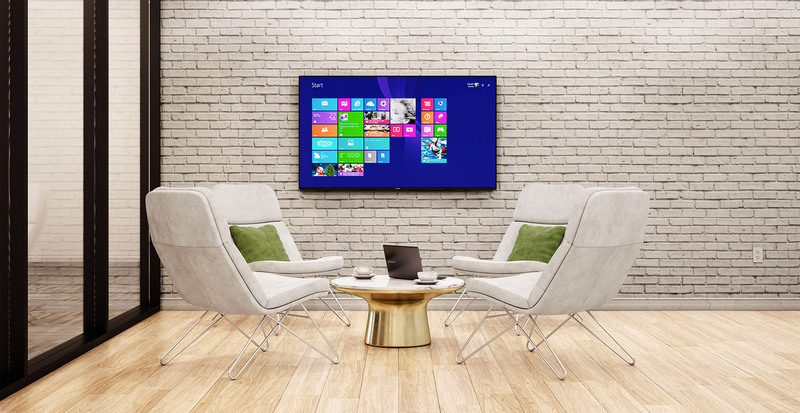 It includes touchpanel control, a resident PC for soft codec video conferencing as well as cable and AC power management. AV signals are switched to a display with an HDBaseT input. The room size requires an audio system for sound reinforcement with full-range, surface mounted speakers. Large conference rooms accommodate groups of 12 people or more, enabling team members to collaborate with a larger group. Wireless connectivity gives attendees the ability to share content from their personal devices. These rooms normally include video conferencing capabilities, enabling team members in remote locations to participate in meetings. 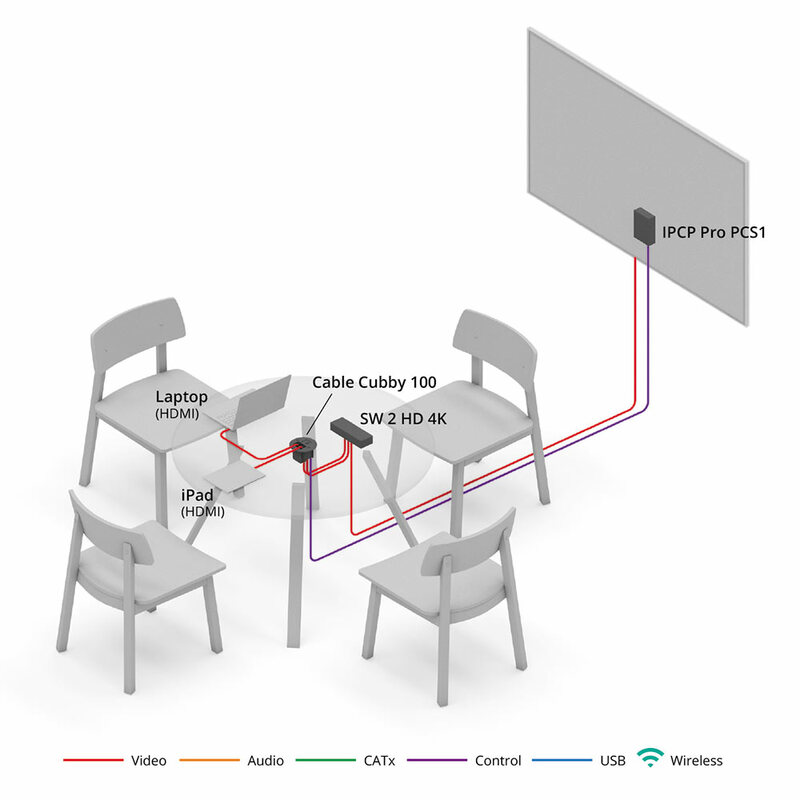 This system supports four HDMI and two VGA source connections at the table along with BYOD wireless connections. A resident PC enables soft codec video conferencing and a satellite TV receiver allows for viewing live broadcasts. The room also features touchpanel control for system operation, cable and AC power management, and an audio system for sound reinforcement. The function of the space will largely drive the form and configuration it takes. To accommodate impromptu, ad hoc meetings, a seating area with a whiteboard or flat panel display could be all that’s needed. Small, informal focused discussions may require an enclosed area along with a way for meeting participants to share ideas using personal devices. For larger gatherings, a formal room equipped with a projector and sound reinforcement may be necessary, so that all participants can be fully engaged in the proceedings. In each of these environments, the inclusion of teleconferencing technology allows meeting participants to be located off site and still collaborate effectively. What is the budget for this space? Sound purchasing decisions are driven by return on investment - weighing costs against benefits, and when facing several alternatives, choosing the one that maximizes return. An initial needs assessment should be performed to determine how many collaboration spaces are needed and what is the required functionality to be included in each space, based on the anticipated benefit that the functionality will bring to the organization. The collaboration systems shown in this document have varying levels of features and capabilities to fit a range of budgets – and all are backed by Extron service and reliability regardless of the price. Effective collaboration spaces need to satisfy the objectives and requirements of meeting participants as well as the organization. Depending on the personnel and their functional roles, meeting space requirements may be different. Customer-facing facilities might merit a higher level of décor and superior audio and video quality. Access levels to the internal network need to be enforced for meetings between outside guests and internal staff. Capabilities such as annotation and ultra high definition displays might be critical for some activities such as engineering and content creation, but may not be required for other activities. What is needed in each space? 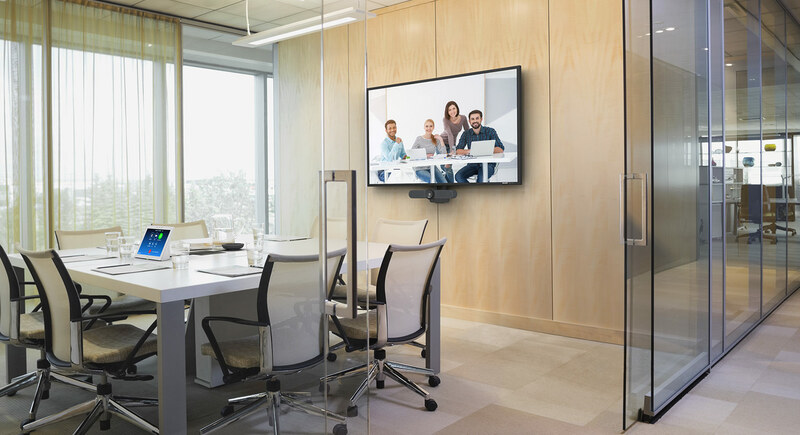 Choosing collaboration and meeting space equipment depends on room size, how users will share content, whether users will be remotely located, and end user aesthetic and operational preferences. For smaller meeting spaces used exclusively by local personnel, a single display without additional audio equipment could be enough. 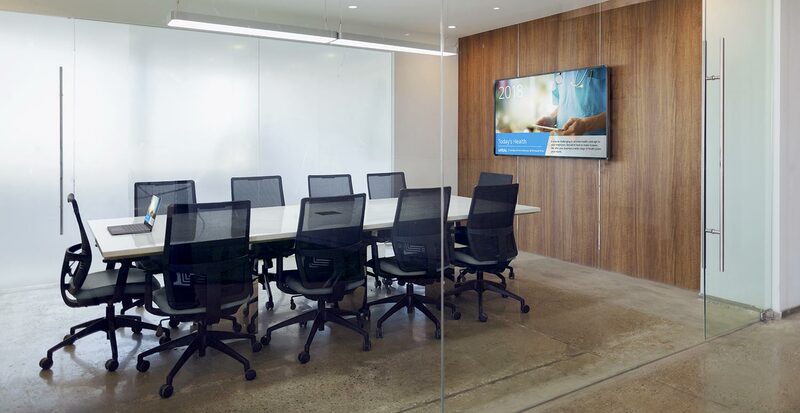 Larger rooms may require multiple display screens and careful evaluation of audio performance, especially when equipped with video conferencing to accommodate several speakers and microphones. How will the space be managed? Central management of AV system resources across a facility improves ROI at many different levels. Each connected room can be remotely monitored and accessed to provide help desk support in the event users are experiencing difficulties. 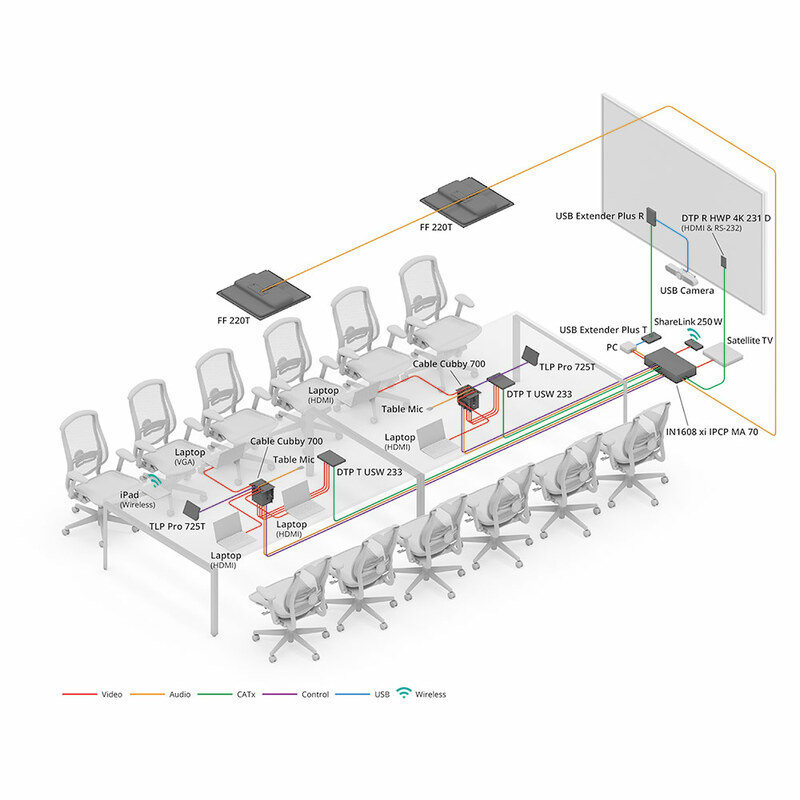 This offers increased efficiency and minimizes downtime so events in the room can quickly continue as planned. Enterprise asset management tools give at-a-glance equipment status, support convenient event scheduling, and include valuable usage reports that can be used for inventory management, scheduling of maintenance tasks, and future system planning. When multiple users want to present content on the main display using their personal devices, there must be some way for them to connect to the display and to switch between each user’s device. This can be accomplished by connecting physical cables, wirelessly, or by a combination of both for maximum flexibility. How will the space be operated? 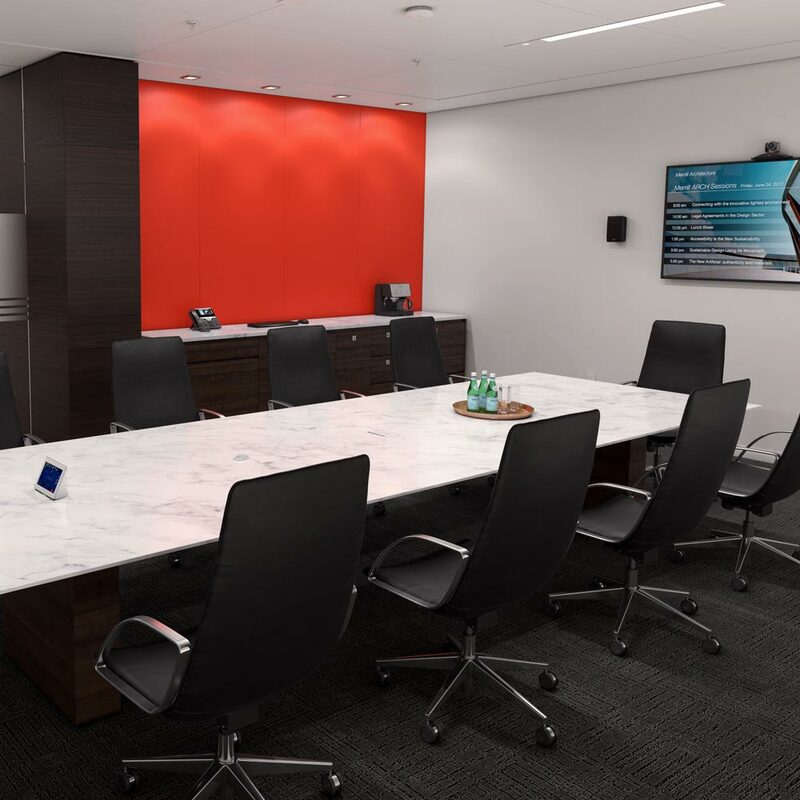 Meeting room technology can be controlled by a variety of methods including physical buttons attached to the equipment, handheld remote controls, touch displays, voice, and automated via occupancy sensors. Each method has its merits in terms of cost, capability, and ease of use. Fully automated rooms are also possible, where the system powers up and configures itself automatically when the meeting starts. For an organization with meeting rooms of varied sizes containing different equipment, a consistent user experience should be maintained. Successful solutions will need to be intuitive and consistent while satisfying the preferences of the users. Cable management within the space. 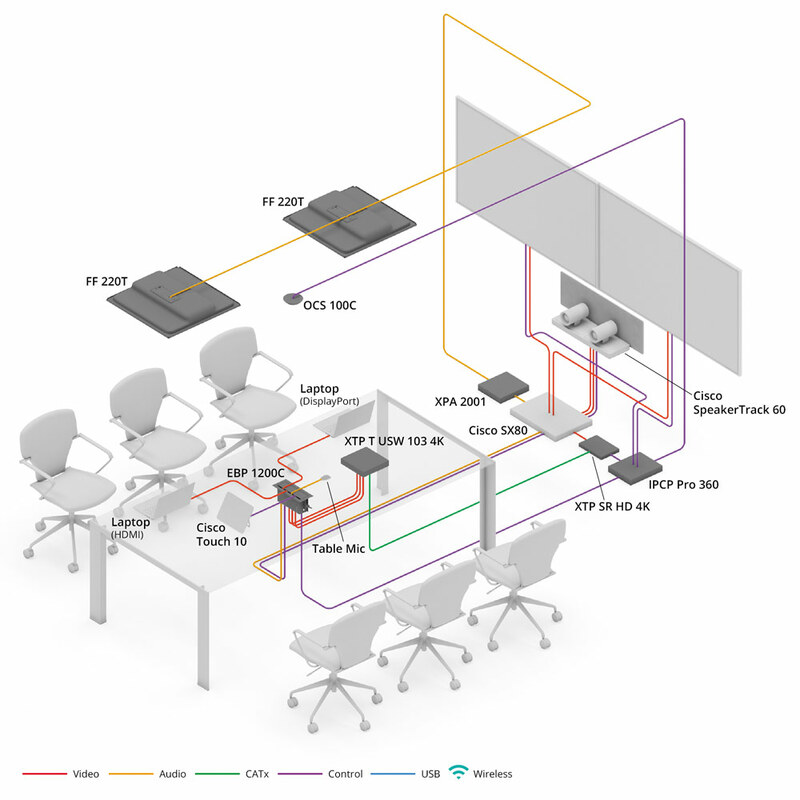 Cable management solutions such as Extron Cable Cubby enclosures and cable retractors help maintain a professional room appearance regardless of whether a wired or wireless presentation is chosen. Although wireless devices don’t require a video cable connection to the display, most still require a cable for charging. With offices around the globe, Extron is able to provide dedicated, full-service support to customers worldwide. Extron’s global presence means that we are here for you, wherever you are.